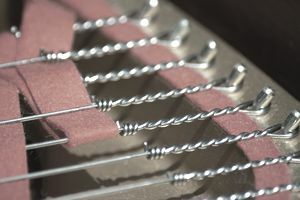 Ductility is a measure of a metal's ability to withstand tensile stress—any force that pulls the two ends of an object away from each other. The game of tug-of-war provides a good example of tensile stress being applied to a rope. Ductility is the plastic deformation that occurs in metal as a result of such types of strain. The term "ductile" literally means that a metal substance is capable of being stretched into a thin wire without becoming weaker or more brittle in the process. Metals with high ductility—such as copper—can be drawn into long, thin wires without breaking. Copper historically has served as an excellent conductor of electricity, but it can conduct just about anything. Metals with low ductilities, such as bismuth, will rupture when they're put under tensile stress. Ductile metals can be used in more than just conductive wiring. Gold, platinum, and silver often are drawn into long strands for use in jewelry, for example. Gold and platinum are generally considered to be among the most ductile metals. According to the American Museum of Natural History, gold can be stretched to a width of only 5 microns or five-millionths of a meter thick. One ounce of gold could be drawn to a length of 50 miles. Steel cables are possible because of the ductility of the alloys being used in them. These can be used for many different applications, but it is especially common in construction projects, such as bridges, and in factory settings for things such as pulley mechanisms. By contrast, malleability is the measure of a metal's ability to withstand compression, such as hammering, rolling, or pressing. While ductility and malleability may seem similar on the surface, metals that are ductile are not necessarily malleable, and vice versa. A common example of the difference between these two properties is lead, which is highly malleable but not highly ductile due to its crystal structure. The crystal structure of metals dictates how they will deform under stress. The atomic particles that makeup metals can deform under stress either by slipping over each other or stretching away from each other. The crystal structures of more ductile metals allow the metal's atoms to be stretched farther apart, a process called "twinning." More ductile metals are those that more readily twin. In malleable metals, atoms roll over each other into new, permanent positions without breaking their metallic bonds. Malleability in metals is useful in multiple applications that require specific shapes designed from metals that have been flattened or rolled into sheets. For example, the bodies of cars and trucks need to be formed into specific shapes, as do cooking utensils, cans for packaged food and beverages, construction materials, and more. Aluminum, which is used in cans for food, is an example of a metal that is malleable but not ductile. Temperature also impacts ductility in metals. As they are heated, metals generally become less brittle, allowing for plastic deformation. In other words, most metals become more ductile when they're heated and can be more easily drawn into wires without breaking. Lead proves to be an exception to this rule, as it becomes more brittle as it is heated. A metal's ductile-brittle transition temperature is the point at which it can withstand tensile stress or other pressure without fracturing. Metals exposed to temperatures below this point are susceptible to fracturing, making this an important consideration when choosing which metals to use in extremely cold temperatures. A popular example of this is the sinking of the Titanic. Many reasons have been hypothesized for why the ship sink, and among those reasons is the impact of the cold water on the steel of the ship's hull. The weather was too cold for the ductile-brittle transition temperature of the metal in the ship's hull, increasing how brittle it was and making it more susceptible to damage.